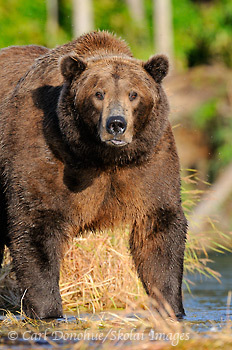 A large male adult brown bear, or grizzly bear (Ursus arctos), stands and stares at the camera. 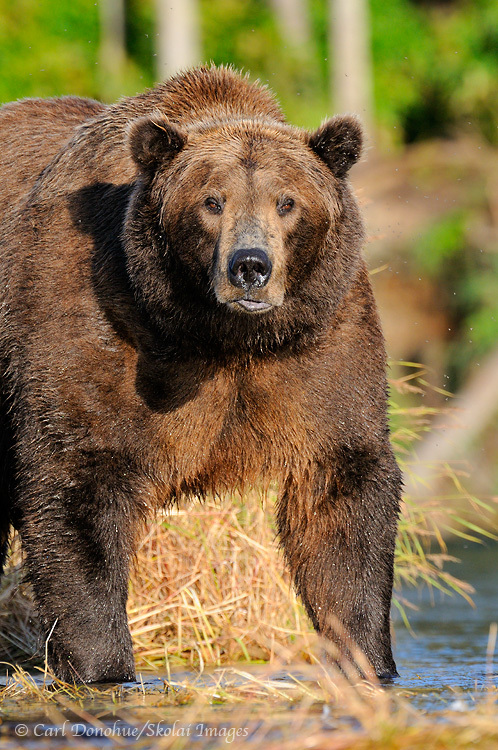 Male brown bears may reach weights of over 1200lbs and easily stand 9′ tall. Brown bear, Katmai National Park and Preserve, Alaska. Please click on the image above to view a larger version of this photo. One of my main goals last year, photographically, was to shoot more ‘bears in the landscape’ style shots; images such as this one were what I was really after. Of course, that doesn’t mean I would pass up an opportunity to fill the frame with a bear like this, either. This kind of image is all about the bear; power, size and vitality. The bears in the landscape speak a little more about place. Fascinating subject, place. I just got back from a trip to Denali National Park and Preserve, where I spent some time in a cabin in the woods, by a fire, trying to stay warm. The day we skied in to the park, the temperatures plummeted, from the 0 to – 5 degreeF range to minus 40 and minus 45. 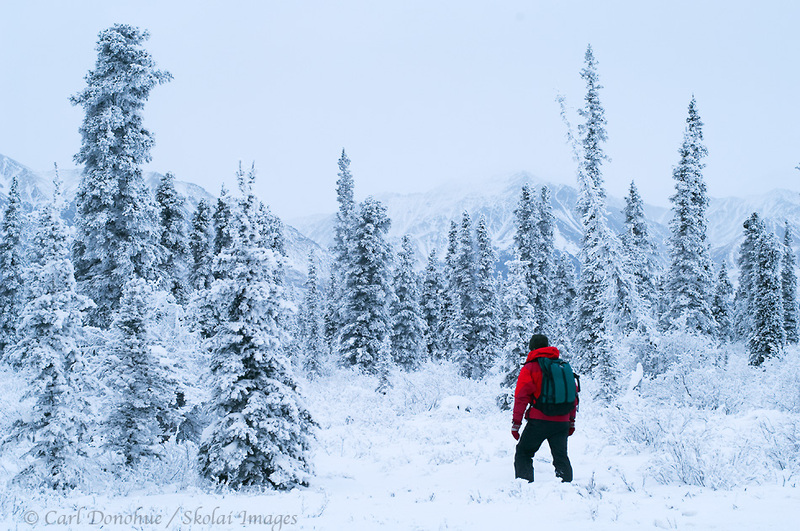 The experience of the Alaska backcountry at that kind of temperature is something else. 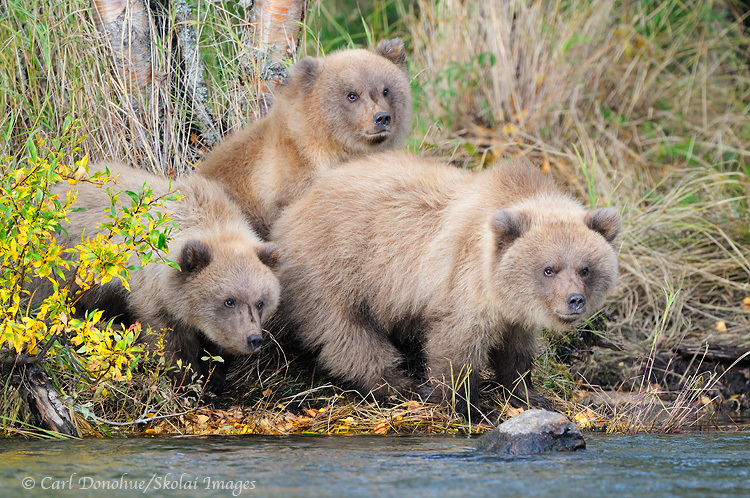 This entry was posted in Adventures, Alaska, Grizzly Bears, Katmai National Park, Musings, Photo Tours, Wildlife and tagged Brown bears, grizzlies, Katmai National Park, photo tours on January 11, 2012 by Carl D.
3 young grizzly bear cubs wait by a river, fall colors in the forest. 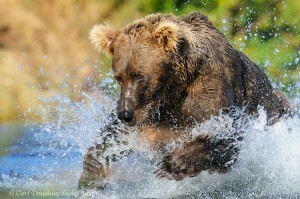 Grizzly bears, or brown bears, (Ursus arctos). Katmai National Park and Preserve, Alaska. Please click on the image above to view a larger version of this photo. By now, all going according to plan, I should be almost getting back from the Katmai National Park Grizzly Bear Photo Tour; here’s an image from last year’s tour, just in case we don’t have much luck this fall. 3 gorgeous young cubs slipping down to water’s edge for a look around, before slinking back to the forest. Next photo should be from 2011. See ya soon. This entry was posted in Adventures, Alaska, Fall, Grizzly Bears, Katmai National Park, Photo Tours, Wildlife and tagged Brown bears, grizzlies, Grizzly Bears, Katmai National Park, photo tours, Wildlife on September 30, 2011 by Carl D.
Mount Sanford, early morning, fall colors and a kettle pond, boreal forest, Wrangell - St. Elias National Park and Preserve, Alaska. Please click the image above to view a larger version of this photo. So while I’m off in Katmai photographing the bears, I’ll schedule a post or 2 from the summer. Here’s a shot of Mt. Sanford not long after sunrise one gorgeous sunny fall morning. What a view! This entry was posted in Adventures, Alaska, Fall, Landscapes, Photo Tours, Wrangell - St. Elias National Park and tagged Fall, Landscapes, Mount Sanford, Mt Sanford, photo tours, scenics, Wrangell - St. Elias National Park on September 19, 2011 by Carl D.
Brown bear sow nursing4 cubs (Grizzly bear, Ursus arctos), Katmai National Park, Alaska. Quadruplets. Please click on the image above to view a larger version of this photo. There’s probably no reason to post this photo other than it seems like a good time to post another grizzly bear photo. This event was quite possibly one of the highlights of the 2 weeks in Katmai National Park last year, on the grizzly bear photo tour. We actually saw 2 separate sows each with 4 cubs on several occasions, which was pretty neat. But the chance to watch all 4 bear cubs nurse at once was a special treat indeed. It’s pretty amazing how much noise the cubs make nursing on the sow. They growl and spat and purr all at once. The mother, the sow, was pretty mellow, just kinda laid back and watched us photographers, wondering what all the fuss was about. It was definitely her most restful time of the day; the rest of her waking moments were spent hellbent chasing salmon up and down the river. Feeding 4 hungry cubs is a big job for a single mom. What a great moment to witness. 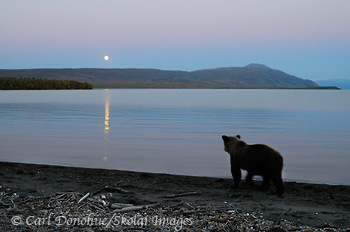 This entry was posted in Adventures, Alaska, Cool stories, Grizzly Bears, Katmai National Park, Photo Tours, Photography, Wildlife and tagged Expeditions Alaska, photo tours on April 4, 2011 by Carl D.
A young grizzly bear (Ursus arctos, brown bear) sands along the shoreline at the Waning gibbous moon, fall, Katmai National Park and Preserve, Alaska. So, another year drips by, eh? And what a year it’s been! 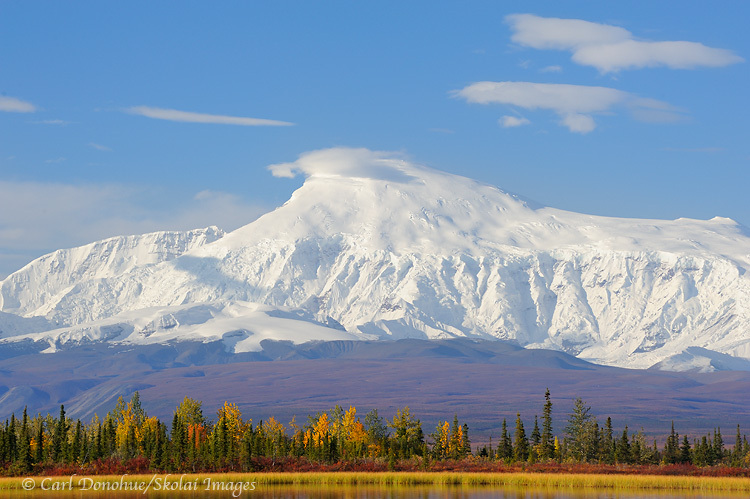 The Arctic National Wildlife Refuge, Katmai National Park, Denali National Park, Wrangell – St. Elias National Park, etc, etc; Alaska is simply an amazing place to explore. 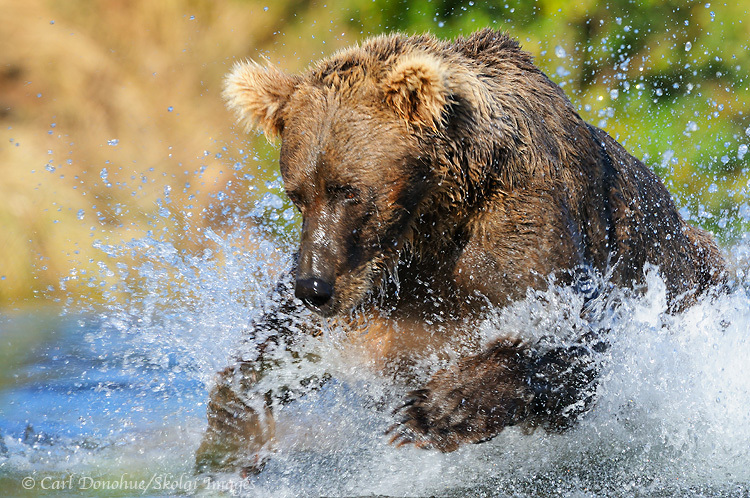 This entry was posted in Adventures, Alaska, Grizzly Bears, Katmai National Park, News, Photo Tours, Photography, Wildlife and tagged Expeditions Alaska, Grizzly Bears, photo tours on December 21, 2010 by Carl D.
A female brown bear (grizzly bear, Ursus arctos) chases Sockeye Salmon up Brooks River. Katmai National Park and Preserve, Alaska. To view a larger version of the image, please click on the photo above. This is a sow grizzly bear, or brown bear as they’re often (and correctly) called. She had 4 cubs, and worked hard (I mean, REALLY hard) to feed them all. Whenever I saw her fishing, she was 100%. 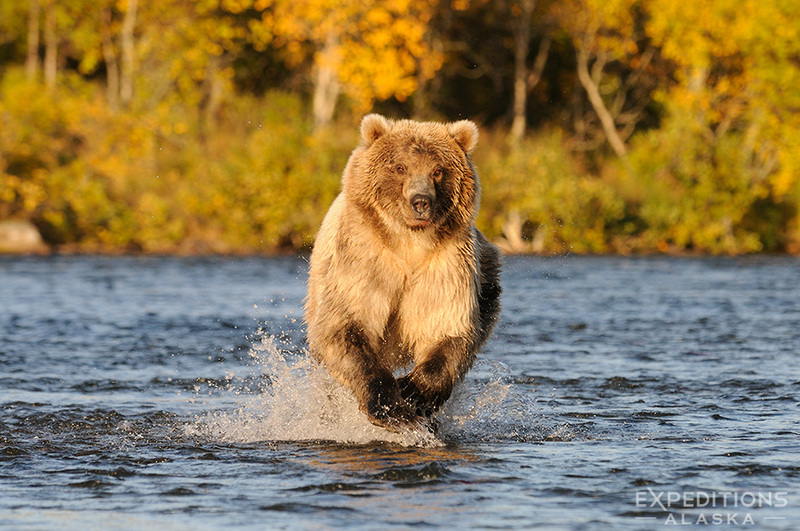 Most other adult bears rarely race around chasing salmon; they tend to walk up and down the river, either in the water or along the banks, and look for an easier dinner. Conserving energy is the name of their game. 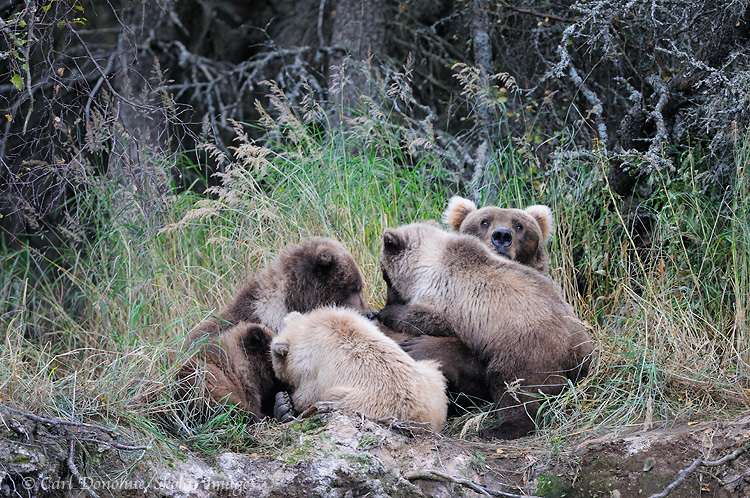 This entry was posted in Adventures, Alaska, Grizzly Bears, Katmai National Park, Photo Tours, Wildlife and tagged Brown bears, Grizzly Bears, Katmai National Park, photo tours on October 26, 2010 by Carl D.
Brown bear cub photo. A young brown bear (Grizzly bear, Ursus arctos) cub. 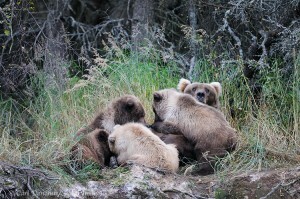 Brown bear cubs will stay with their mother for 2-3 years before venturing out alone. Brown bear cub, Katmai National Park and Preserve, Alaska. Please click on the image above to view a larger version of the photo. 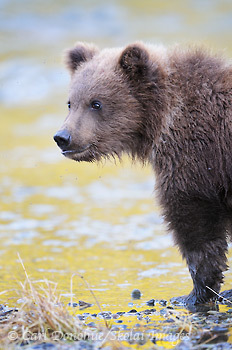 Here’s a young spring bear cub photo from the recent photo trip I led to Katmai National Park and Preserve. This youngster had 3 siblings, and it was a real treat to get to see them play and tumble together. Catching a photo of one by himself, without the others in the frame, was more difficult than one might guess it would be. Last year, for some reason, there were not too many spring cubs in the area at all, but this year the area was home to quite a few. They’re such a blast to photograph, and oh-so charismatic. Each has his/her own character, and some of them are unbelievably plucky little critters. We watched one take quite a dunking from his mother, after he tried to steal a salmon from her. She grabbed him in her mouth, shook him back and forth like a rag doll, and literally buried him in the river. I thought ‘well, that’ll teach the little guy a lesson’ – Hardly! He came up growling louder than before, grabbed the fish in his mouth, and took off with it before his mother could even snap at him. They’re just way too cute! These little baby bears are born in the dark of winter, tiny and defenseless. Their mothers-to-be enter a den in late fall, usually anywhere from late October through November. Brown bears almost always enter their den during a snow storm, or immediately before a snow storm. The theory most folks ascribe to is the snow storm will cover both the entrance and the tracks leading to the den, hiding both the bear and the den’s location. 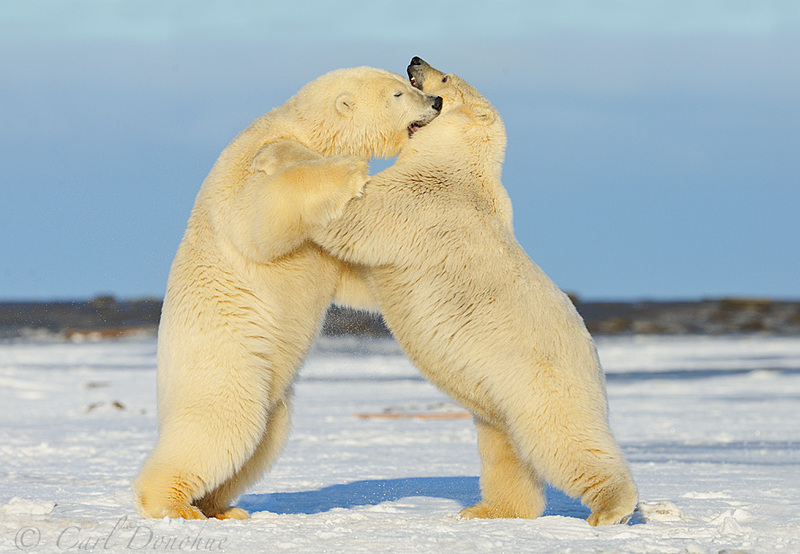 This entry was posted in Adventures, Alaska, Grizzly Bears, Photo Tours, Wildlife, Wrangell - St. Elias National Park and tagged Grizzly Bears, photo tours on October 13, 2010 by Carl D.